Valerie's thoughts on current trends in the HR market. Gain insight into the toughest HR questions. Browse our current executive search and contracting opportunities. See a list of our hottest HR consulting and contracting projects from around the world. With the holidays barreling down upon us and the demand for strategic HR leaders getting more voracious, we are B-U-S-Y and thus sending out a really brief update this month. You can see all our current/new HR searches below, plus some info on what’s hot on the consulting side. What else, may you ask, have I and my team been up to? Glad you asked. For a number of reasons (deep appreciation for the surgical team who saved my daughter’s life, wanting to give back, bored with formal events), I cancelled our VF&Co Winter Social and, with my core team, decided to help families whose babies and children are having cranial neuro-surgeries this month. 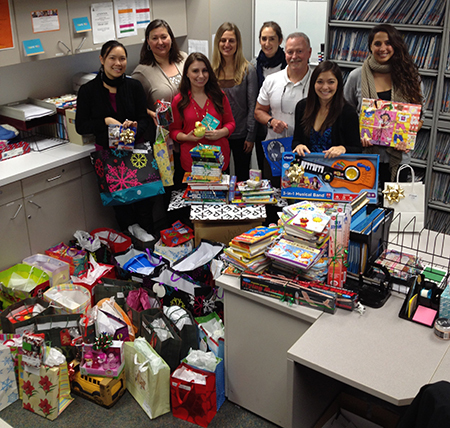 Combining our winter social fund, plus contributions from myself and my employees, we partnered with the Cranial Facial Neurosurgery Department at Children’s Hospital Oakland to purchase, wrap, and label enough gifts, books, and art packs for pretty much all the children who will be in the hospital over Christmas (191 beds’ worth). As you can see in the photo, which was taken in the surgical nurses’ office, the eight of us were really happy to help make these babies and kids a little happier. It seems that everyone likes to give back at Christmas time, and in addition to this, my family and I have participated in giving trees at my husband’s hotel, at church, and even at the pre-school. After the tragic shootings last Friday at Sandy Hook Elementary School, making people happy, even if one at a time, feels good and helps to heal our nation’s wounds. Have a great holiday season and let’s keep those 26 families in Newton in our prayers. Complete revamp of the talent acquisition function for one of the fastest-growing financial services companies in the U.S.
Join Valerie and special guest, Career Management Fellow John Motroni, as they discuss best practices around layoffs and outplacement services, and learn how to protect your company’s employment branding through your reorganization. Topics include the top 7 mistakes to avoid, timing your RIF, creating a strong outplacement package, and evaluating outplacement vendors to find the best fit for your company. To sign up, please click here. For questions, email us at info@vfandco.com. Valerie Frederickson & Company (VF&Co) is a human resource executive search, HR consulting and corporate outplacement firm known for helping clients build and sustain winning teams in today´s rapidly changing marketplace. Since 1995, VF&Co specializes in creating customized solutions to meet an organization´s human resource needs at every stage and size from start–up to Global 500. Re–evaluating your outplacement vendors? Require a higher utilization rate for your outplacement dollar? Need higher touch services and consistency across all markets? Since 1995, VF&Co is the outplacement firm of choice for sophisticated corporate buyers. Join the numerous Fortune 500 employers and small firms who have selected us over their previous vendor and are now enjoying the best of both worlds: each employee well taken care of, and consistency in every city. Price shopping or need to customize a program? Contact our Corporate Outplacement Team at 650-614-0220 or email them at outplacement@vfandco.com for more information on our outplacement services. With the dramatic increase of global technology outsourcing and the continued geographic dispersion of corporate teams, the need for international human resources strategy, design, and project implementation has increased. Our global team of HR consultants has the specialized skills and breadth of expertise to develop and lead your initiatives—saving you time, money, and resources. We can manage the international recruiting function, help you hire key local managers or an entire startup team in an overseas market, and establish HR systems for global expansion. Results-driven, value-oriented. To keep your HR programs in line with your corporate direction, we provide HR strategy, cost-effective HR infrastructure, and pragmatic HR advice across all critical areas of human resource management. Any size, any stage. We draw upon years of experience with startups, midsize firms and large global enterprises to guide our clients strategically through any stage of growth. Work smarter, not harder. In survey after survey, CEO's say the number-one issue keeping them up at night is "people problems." We help you solve them so that you can get back to focusing on your business. Prompt results. The average time from start of search to presentation of the winning candidate is 21 days. 87% of searches are completed in less than 45 days. Superior results. More than 95% of executives placed by VF&Co are still with their companies five years following placement. High client satisfaction. More than 90% of the firm's work is either repeat business or from referrals. A number of clients have been with VF&Co for more than a decade. Contact our Executive Search Team at 650.614.0220 or email them at executivesearch@vfandco.com to learn how your organization can reap the benefits VF&Co can deliver: Improved performance and greater success through your most valuable asset—your people. VF&Co welcomes and encourages all diversity candidates to contact us directly. We highly value the diversity of our VF&Co team, placement of diverse executives into our client companies and our diverse clients, candidates, and supplier partnerships. We want to help swing the pendulum the other way. The VF&Co newsletter, "VF&Co In the Know," and VF&Co Executive Search Update are the intellectual property of Valerie Frederickson & Company. They are a free resource to business professionals. To subscribe to this newsletter, email info@vfandco.com.